It’s Food Fact Friday. On this day, I reveal an interesting food fact. Today, we’re learning about chocolate. I’m a little delayed in posting my food fact today but can you blame me – I just adopted a new kitty. 🙂 I wanted to talk about chocolate because I’ve made a resolution to eat a piece of chocolate everyday and it’s the background for my website. Why? Because I love it and due to it’s amazing health benefits. And just because it tastes good so why not? 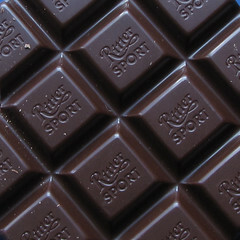 If you’re worried about the fat content, you’ll be happy to know that only 1/3 of chocolate is bad for you. The fats in chocolate are 1/3 oleic acid, 1/3 stearic acid and 1/3 palmitic acid. If eaten in moderation (a piece of day), you will reap the benefits. However the primary benefits listed above are limited to dark chocolate so avoid all other kinds since they contain fatty ingredients like milk and nougat.